Now that we know our baby is a boy I feel like I can really dive headfirst into setting up his nursery. 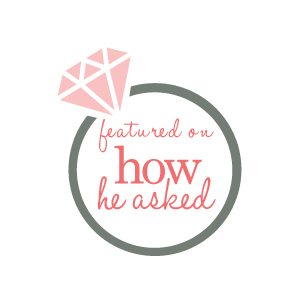 While I plan to keep it pretty neutral and will have a lot of the same elements I would have had for a baby girl, I am excited to find sweet little boy touches to add. T.J. and I have a shared dream of floor to ceiling bookshelves and a rolling ladder in our future dream home. We are hoarders of books. 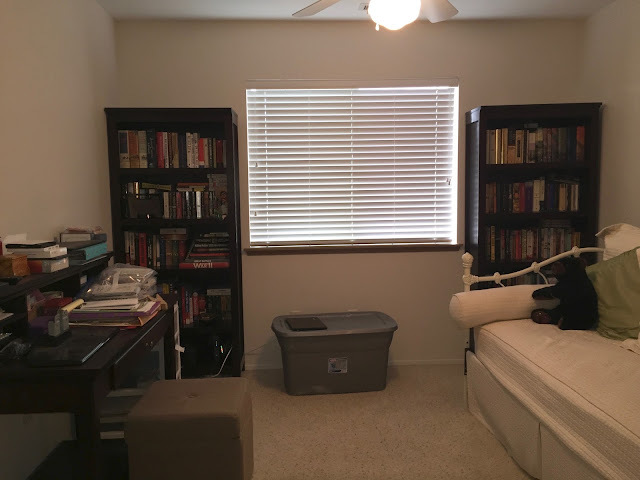 So while the desk went to goodwill, we decided to move one of the bookshelves and some of our favorite reads to our bedroom, and the other will go to the garage. I suppose I could have kept them in the nursery but I am going for lighter colors for the crib and other furniture. I really just want this room to be soft and light and airy which those shelves are not. The daybed, however, is staying put. I like that it's another option for sleeping if we are every overrun with house guests, and I also imagine there will be more than a few sleepless nights with a new baby when I myself will appreciate having a place to lay down in there. Also, it's been my bed since middle school and I'm just not ready to say goodbye. 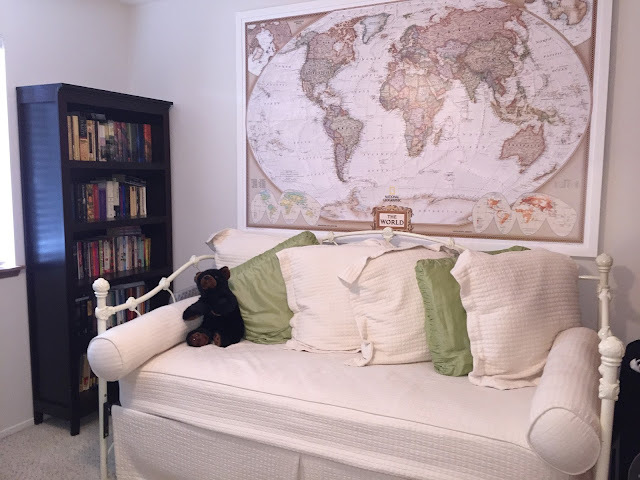 The map is also staying in the room. I love how it fills the space but is also still quite soft and neutral. 1. Buy a crib, glider, and dresser for starters. My mom and sister are coming to visit next week for sister's spring break and shopping for nursery furniture is high on our list of activities during their stay. There is a Pottery Barn Kids in Seattle and it will be so much more fun to make that drive with them instead of solo. This is the crib I have my eye on. I really don't like the cribs that have the solid back. I think the point of those is that it eventually can convert to a head board but they're just not my style. 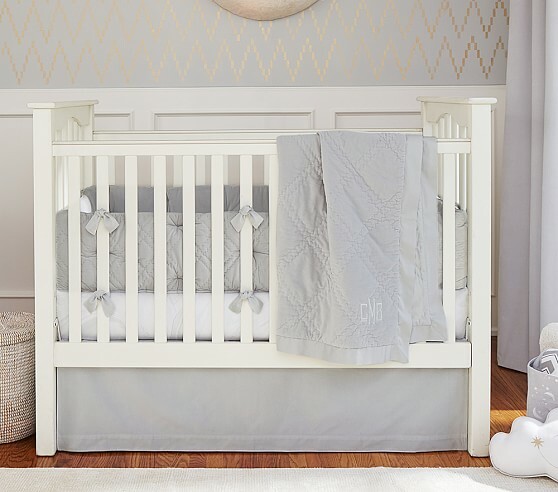 I wanted something classic, simple, and white and love that this will work for any future babies as well. 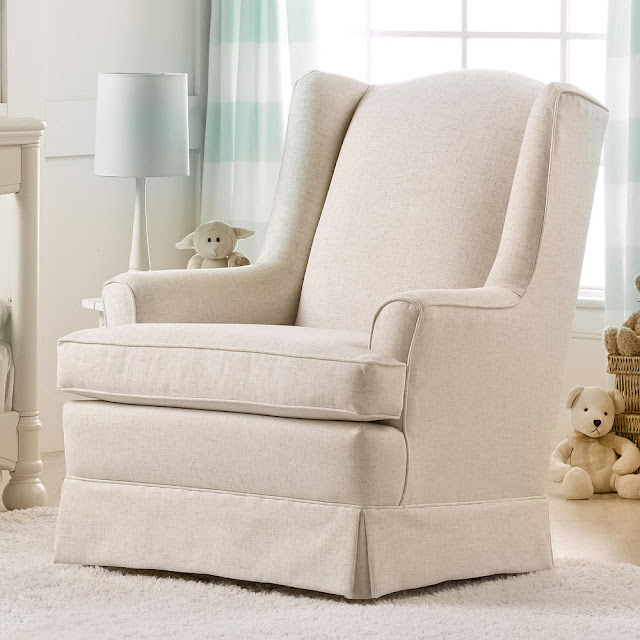 I just ordered this glider online from Babies R' Us. It's not sold in stores so I haven't seen it or sat on it in real life which makes me more than a little nervous, but it has amazing reviews so I'm taking a chance. I have very high expectations for this chair and will definitely let you know if it's as comfortable and pretty in person as the reviews claim. I had my eye on a similar wingback chair from Pottery Barn Kids and it's absolutely beautiful but way out of my price range so I'm hopeful the one I ordered will be a good alternative. These are a few of the dressers/changing tables I'm considering. 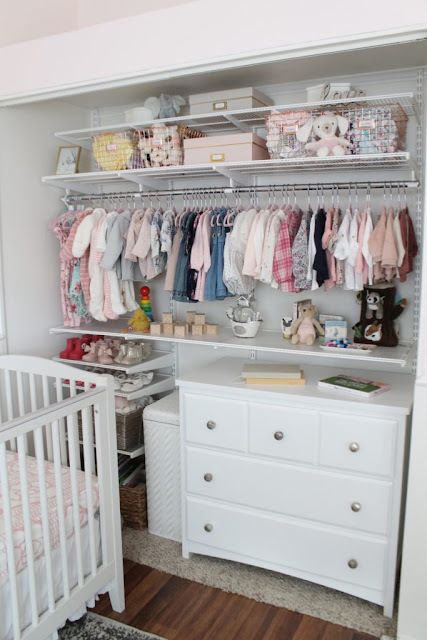 I want something white to match the crib and it needs to have a small footprint because it is going in the closet. Of course I prefer the more expensive one from Pottery Barn Kids but I also really like this Target dresser for less than half the price, though I'd replace the knobs with something more rustic and boyish. Decisions. Decisions. 2. Add new shelving for our boy's already growing library, and storage for his toys and knickknacks. Yes I just removed bookshelves, but yes I will be adding in different bookshelves. On the wall next to the daybed, I plan to add some floating ledges plus a cute basket or bin on the floor for toys. 3. Add organization to the closet. Since we don't have a designated playroom and we won't have a ton of floor space in our living room I want to make sure his nursery is set up for playing as well. The daybed does take up a considerable chunk of real estate so I am planning to put the dresser in the closet so we don't have wall to wall furniture. I'm also debating on possibly removing the closet doors depending on whether or not I can open and close the drawers. 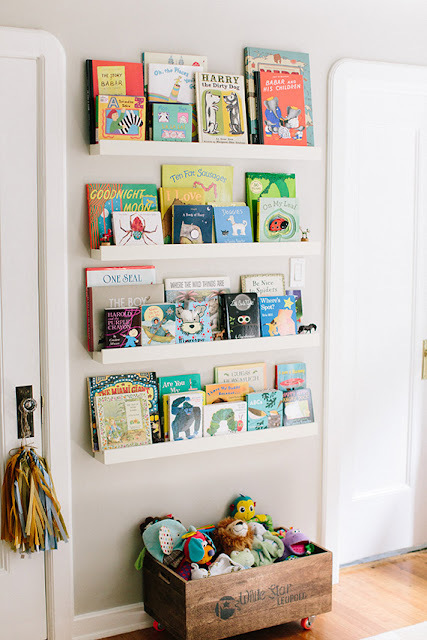 And I want to add some more vertical shelving since tiny baby clothes don't require all that much hanging space. Mom and sis... add a trip to the Container Store to our itinerary. 4. Curtains and other decorative touches. Though I've been told it's a good thing if your baby can sleep in any sort of light, not just a dark bedroom, I want blackout curtains because this room gets a ton of sunlight first thing in the morning. Also, we don't have air conditioning in our house and blackout curtains tend to keep the rooms cooler for those couple of days in the summer when I wish we had AC. Since most of the room is pretty neutral I can't decide if I'd rather do white curtains or go with something with a color and pattern. I also plan to swap out the green pillow shams currently on the daybed for something blue. The cream daybed cover and pillow shams are from Pottery Barn so I love the idea of adding these blue quilted ones from there as well, but again I just don't love the price so I'm still shopping around. Another thing I'm looking to add to this space is artwork for over the crib. I love these farm canvases from DeAnn Art and think they are perfect for a little boy, especially one whose parents have roots in the south. Along those rustic lines I received the most adorable felted lamb mobile and it is just perfect. I am so excited for this room and the little man who's going to come home here. I can't wait to snuggle and rock him in the chair, and read him sweet stories, and lay him down to sleep in his crib. I'm totally feeling the nesting vibe and wondering if it will ever not feel so huge and incredible and wonderful that our house of 2 is soon going to be home to 3. Plus Hunley. We can't forget about Hunley. 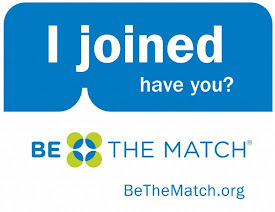 Great ideas and I know you will get it all accomplished with the help of your mom and sister. A fun and exciting week ahead!! Pretty sure Hunley will not let himself be forgotten : ) Can't wait to see you, shop, and make space for baby boy! I love the neutral colors! I also bought shelves for my son's library but have yet to put them up! Your nursery sounds like it will be perfect. I love the idea of keeping the day bed in there. You will definitely appreciate having the space to lie down. I made a huge mistake with our glider. It is comfortable to sit in and rock but it doesn't recline enough to be comfortable for the frequent night nursing sessions in the early weeks. It will for sure have to go for the next baby. oh boy. I am really keeping my fingers crossed that the glider will be comfortable and functional enough to keep for all our babies. we shall see.... I feel like it's one of those things that you don't know until you've actually sat in it for a late night feeding with your baby.